view another article... This foot condition is the new back pain — it’s everywhereCarestream, CurveBeam to spread word about weight-bearing CTNew Cartiva ImplantPain Free Plantar FasciitisUFAI featured on ABC NewsFoot Surgery InnovationsBiggest Opportunities for Foot SurgeonsDoctors TV Show - Foot Surgery while Pregnant10 Diseases Your Feet Can Reveal, Readers DigestPlantar Fasciitis TreatmentsThe Doctors TV, Living with Plantar FaciatiisHow to Stop Foot Pain for Good44 Ways to Correct Hallux ValgusDo fat-soled running shoes protect aging joints?Ankle replacement can restore mobilityCam Newton's Ankle InjuryMinimally invasive Foot & Ankle Surgery49ers' Crabtree 'amazing' Achilles recoveryAbout Kobe Bryant's Knee InjuryCurry more likely to play than Bryant3-D Scan Reveals Foot Damage by High HeelsAlbert Pujols' Foot InjuryWill Kobe Return? Doctors Raise Questions About Laker Star's Future In The NBAWhat Kobe must do to prove 'doubters' wrongKobe Bryant's difficult task ahead after injuryPau Gasol's return from foot injuryIs barefoot running a bad fad, or better choice?Born to Run Barefoot?Born to run barefoot? Some end up getting injuredCan a $15 basketball shoe have game? Athletes heal at different rates – especially when comparing a 320-pound football player to a 6-foot-7 basketball player. But the timeline the Panthers laid out for defensive tackle Star Lotulelei’s recovery from a stress reaction in his right foot is nearly identical to the one followed by Charlotte Hornets small forward Michael Kidd-Gilchrist last winter. That shouldn’t be a surprise: Panthers doctor Robert Anderson, the renowned foot and ankle surgeon who performed Lotulelei’s foot procedure in January, also treated Kidd-Gilchrist’s stress reaction. Kidd-Gilchrist missed nearly a month last season after he felt a strange pain in his right foot during the Hornets’ west coast trip. After an MRI revealed a stress reaction, Kidd-Gilchrist took four weeks off before returning to action. A similar recovery would allow Lotulelei to play in one of the Panthers’ final exhibitions. Anderson was at Wofford on Monday when Lotulelei motioned for the training staff after a play in team drills midway through practice. Lotulelei was carted to the locker room to be examined, and an hour later he was in a walking boot with a noticeable limp. Dr. Bob Baravarian, a California foot and ankle specialist, said it’s not uncommon for athletes who have had surgery to repair broken bones in their foot to be treated for stress reactions, which are a swelling of the marrow inside the bone. Stress reactions are a precursor to stress fractures, or cracks to the thick, outer shell of a bone. Rest is the best medicine. “The goal is to try to let the bone have a chance to recover a bit longer because the stress reaction shows it’s not quite ready yet,” said Baravarian, a foot and ankle specialist at Providence Saint John’s Health Center in Santa Monica. Baravarian said inserting an insole in the player’s cleats can reduce the pressure on the affected area. But he pointed out offensive and defensive linemen are prone to such mid-foot injuries because of the nature of their positions. Lotulelei, the Panthers’ first-round pick in 2013, broke his foot in January during a practice before the divisional-round playoff loss at Seattle. He participated in organized team activities and minicamp during the spring without any apparent setbacks. But he’ll be sidelined through the remainder of camp at a minimum. 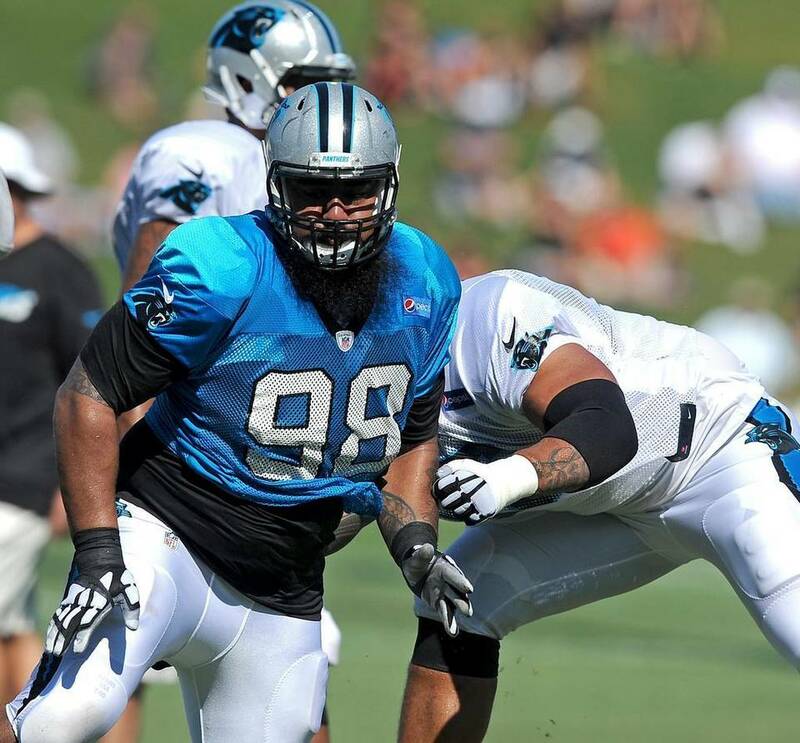 Baravarian believes the Panthers’ approach should have Lotulelei ready for the regular season.